In November, President Donald Trump set the stage HOW? for a remarkable bipartisan achievement that his predecessor, Barack Obama, failed to achieve. In November, President Donald Trump announced he would support a prison reform bill that also addressed federal sentencing laws, setting the stage for a remarkable bipartisan achievement that his predecessor, Barack Obama, failed to achieve. Advocates for criminal justice reform and smart-on-crime Republicans had been pushing for such a bill through Obama’s tenure, to no avail. In an only-Nixon-can-go-to-China moment, Trump ushered through needed reforms in the federal mandatory minimum sentencing. Another victory came in Mexico’s agreement to have asylum seekers wait for their court date in Mexico. The bombastic president and his buoyant base like to frame the lack of good news coverage as left-wing bias, but Trump has no one but himself to blame for making his victories fade into the background. Trump also volunteered that he would “take the mantle” — when instead his administration dropped the ball. The White House voiced no objection, and Washingtonians prepared to leave town for a no-drama Christmas. Indeed, Trump could have ended the week on the up note of a signing ceremony for a bipartisan prison and sentencing reform measure that brought progressive Van Jones, a CNN host and former Obama adviser, and Heritage Foundation head Kay Cole James into the White House. It was only after Rep. Mark Meadows, R-N.C., predicted that the Trump base “will just go crazy,” and others in the Trump base agreed, that the president drew his line in the sand. 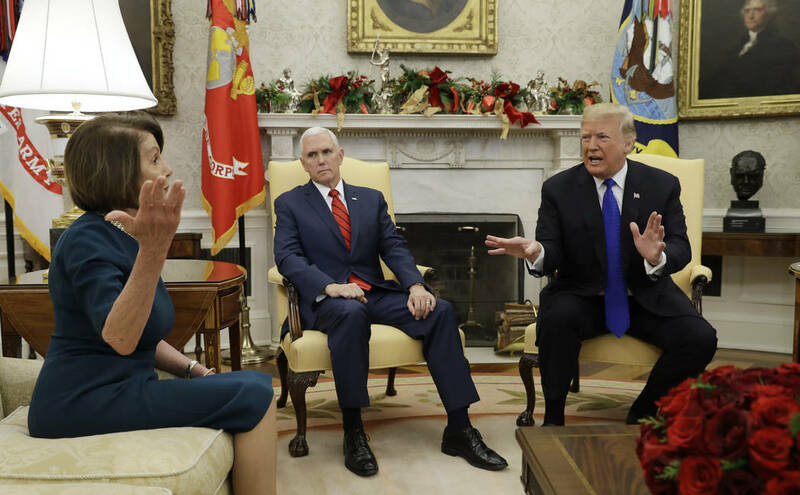 The House passed a spending bill with $5 billion for border security — and thus proved Pelosi wrong when she told Trump the GOP House couldn’t produce enough votes to pass a bill with wall funding. Meanwhile, Trump’s apparent reversal made Republican senators who support border security appear feckless — even though Trump is the guy who helped border funding go from $1.6 billion to zero.